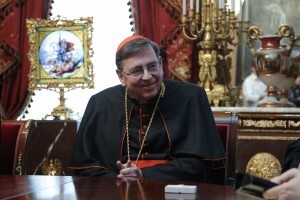 (Vatican Radio) The President of the Pontifical Council for Christian Unity, Cardinal Kurt Koch, heads off to Russia on Saturday for a visit being seen as an important milestone on the road towards reconciliation between the Catholic and Russian Orthodox Churches. The Swiss Cardinal will spend five days in St Petersburg and Moscow, celebrating with the small Catholic communities there, as well as meeting with Russian Orthodox bishops, priests and seminarians. On the final day of his trip, Wednesday 18th, he will hold talks with Russia’s vice-minister of foreign affairs and with the Russian Orthodox leader, Patriarch Kirill at Moscow’s historic Cathedral of Christ the Saviour. “St Catherine’s is the oldest Catholic Church in Russia and it is considered the mother of all churches in Russia…..it’s very famous for its saints and for its very tragic destiny…..it was closed before the Second World War and remained closed until the 1990s…. This meeting is especially important as it will be the first meeting of the Cardinal as representative of the new Pope with Patriarch Kirill. Cardinal Koch already met with the Patriarch in Moscow two years ago….but probably it’s the moment now to give some symbolic gestures and to go forward in our relationships and I hope this meeting will help in this way…. Each time the Cardinal meets the Patriarch or Metropolitan Hilarion meets the Pope, there are discussions about this (possible encounter of the Pope with the Patriarch)…..everybody now can see that we need this meeting, yes.